We at Geeky Hobbies would like to thank Drakhar Studio and Badland Games for the review copy of Ginger: Beyond the Crystal used for this review. Other than receiving a free copy of the game to review, we at Geeky Hobbies received no other compensation for this review. In Ginger Beyond the Crystal you play as Ginger. When the world is threatened by unknown forces, Ginger needs to restore order to the world by purifying the crystals that have been corrupted to reestablish a connection with the goddess that protects their world. For anyone who grew up with 3D platformers in the 1990s and early 2000s, Ginger: Beyond the Crystal is going to feel quite familiar. 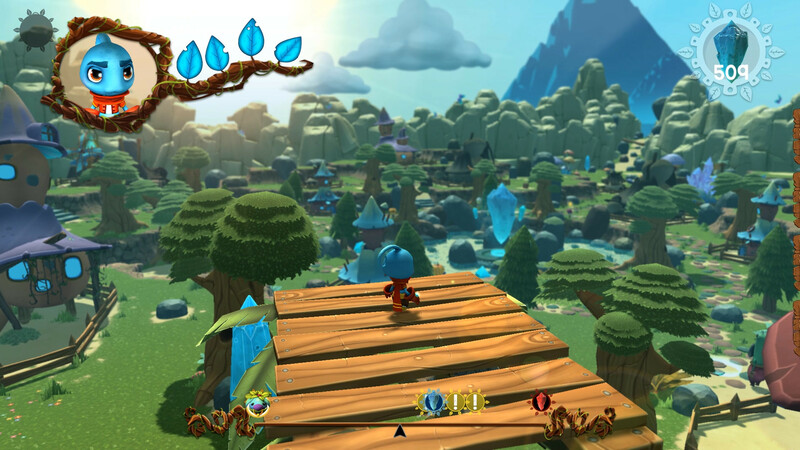 Like many 3D platformers from that era, the basic gameplay involves platforming, fighting enemies by jumping on their heads or punching them, and a little puzzle solving. Basically Ginger: Beyond the Crystal takes a lot of inspiration from the 3D Mario platformers. While Ginger: Beyond the Crystal may not revolutionize the 3D platformer, it does such a great job at what it is making it one of the best traditional 3D platformers on Steam. If you like 3D platformers I think you will really enjoy Ginger: Beyond the Crystal. The combat could use a little work since it is pretty basic but it does its’ job. The game is good because of the platforming. While it could be a little more challenging, the platforming just feels right. Playing Ginger: Beyond the Crystal just brought me back to the 1990s and early 2000s when I would regularly play platformers. With the genre being ignored for so long, it is nice to play a good 3D cartoon platformer. I will admit that I didn’t have huge expectations for Ginger: Beyond the Crystal before playing it. It looked like a solid but unspectacular platformer. I knew I would enjoy it since I like pretty much every platformer but I was surprised by how much I enjoyed it. I played the game for hours at a time and it is one of the more enjoyable platformers that I have played in quite some time. While I have not quite finished it yet, I can tell that I am going to be disappointed when it ends. Hopefully the game will someday get a sequel as it would be a game that I would really want to play. I think the best part of the game are the level designs. The level structure is pretty similar to a lot of the 3D Mario games. You basically enter a warp that takes you to a specialized world that acts as the level. The goal of each level is to make your way towards the corrupted crystal in order to purify it. While the levels could be a little more challenging, the amount of work that went into creating each level has to be applauded. The game has 15 different main levels and each one feels unique. While you are mostly just jumping and fighting enemies in every level, the designers did a really good job mixing things up which makes every level feel different. Just to give you a glimpse of the different types of levels, in one level you are exploring a haunted house, in another you are fighting off an alien invasion on a ship, and you even get to go to a fair. In addition to the level design, I think the whole game world is well designed. While the story is nothing special (like most platforming games), the game has such an engaging atmosphere. The world of Ginger: Beyond the Crystal is a world that you want to explore. The characters and worlds are colorful and look very good for an indie game. Outside of the fifteen main levels, the ultimate goal is to restore the three worlds that were destroyed. In order to unlock the main levels you must rescue the civilians, rebuild the world’s buildings, and buy funny accessories for the villagers to cheer them up. This mechanic is mostly used as a way to use the materials and resources that you gather throughout the game. In the first world this mechanic actually forces you to build up your resources in order to fix up the town in order to proceed to the next main level. If you take your time though you will be able to quickly build up your resources to the point where you can pretty much build up the entire second and third world as soon as you show up. I was able to do this for the second and third world to the point where I just strolled in and fixed almost everything immediately which allowed me to focus on the main levels. Overall there is nothing wrong with this mechanic but it is more of a filler mechanic than an essential element to the game. Throughout the game you will also end up acquiring different costumes which unlock new abilities for Ginger. Most of these new abilities are things that you will use to overcome obstacles. For example the first costume you unlock is a musical instrument that presents you with a memory rhythm style mini-game that you need to complete to remove the obstacle in your way. Another example is a mouse costume that makes your character small which lets you enter areas that you would otherwise be too large to enter. The costumes don’t really add much to the basic gameplay and are mostly used as basic puzzle mechanics. After beating every normal level, you will reveal a corrupted crystal which leads you to a bonus level. Each bonus level is a platforming challenge where the goal is to reach the crystal(s) located around the level. These levels involve jumping between rotating/twisting platforms without falling to your death. These seem very similar to some of the bonus levels in 3D Mario games. While I don’t think they are necessary to proceed in the game, I would highly recommend them since they are the purest platforming levels in the game. The final “challenges” in the game are little side quests/chores that you can do for the various townspeople. Completing these side quests will reward you with materials that you can use to help rebuild the houses. Most of these side quests involve you running around town collecting different items with the occasional race and fight against enemies sprinkled in. I actually think it is kind of funny that you have to do chores for the townspeople just to get the materials to help rebuild their houses. Why can’t they just use those materials and rebuild their own houses? I guess that’s just video game logic for you. Overall these side quests are not bad but at times kind of feel like filler that you don’t really need to do unless you want to 100% the game or you need more materials to build the houses. As far as difficulty it is a little hard to classify Ginger: Beyond the Crystal. It is not super easy but also isn’t so hard that it will make you tear your hair out. I would say that is easy enough that children should be able to play it and yet it is not so easy that it is boring for adults. If you have any experience with platformers you won’t die a lot and the game’s puzzles aren’t particularly challenging but it has enough challenge to keep you interested unless you insist on always being challenged. If you are looking for more of a challenge you can also play in Old School Mode which basically eliminates the checkpoints forcing you to retry the level from the start whenever you die. This will add some challenge to the game but I don’t think it will magically make the game really challenging. As of the writing of this review I have not quite finished beating the game as I has just a couple levels left to finish. It is kind of hard to estimate the exact amount of time that you will get out of the game. If you just do the absolute minimum needed to beat the game I would guess that the game would take 4-6 hours. That number may be a little off since I did all of the side quests and other challenges not necessary to beat the game. So far I have played the game around six hours and I would guess it will take another hour or two to finish the game. When I finish the game I will have probably completed 90-95% of the game. To complete the rest of the game would probably take another hour or two. Therefore I estimate that Ginger: Beyond the Crystal will take around 4-10 hours to complete depending on how if you want to do the bare minimum or if you want to 100% the game. I was surprised by how much I enjoyed Ginger: Beyond the Crystal. I have always loved the platforming genre but I expected it to just be another solid 3D platformer. While the combat could be a little better and the game could be a little more challenging, I enjoyed every minute of Ginger: Beyond the Crystal. The level and world design are fantastic. When playing Ginger: Beyond the Crystal it just feels like you are playing one of the good 3D platformers from the 1990s and 2000s. If you don’t really care for platformers or insist on being challenged, Ginger: Beyond the Crystal may not be for you. If you miss the days of the cartoon 3D platformer though, I think you will love Ginger: Beyond the Crystal. Has fantastic level and world design. A great reminder of the 1990s and 2000s 3D platformer. The combat is a little basic. While not so easy that it is boring, I wish the game was a little more challenging.